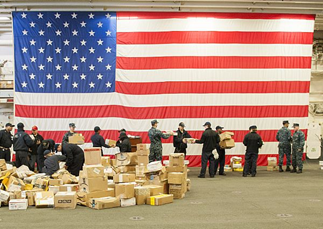 Sailors sort mail aboard USS Bonhomme Richard. U.S. Navy photo by Petty Officer 1st Class James Mitchell. WASHINGTON — Thousands of men and women in the nation’s diplomatic corps and in the military will be serving abroad during the holidays and the mail is a great way to stay connected with them by sending them cards, letters, presents and care packages for the festive season. The Postal Service offers a reduced price of $17.40 on its largest Priority Mail Flat Rate Box for mail sent to APO/FPO/DPO (Air/Army Post Office/Fleet Post Office/Diplomatic Post Office) destinations worldwide — a $1.50 discount from the regular price. Priority Mail Flat Rate Boxes are available at no cost at local Post Offices and also can be ordered online. Postage, labels and customs forms also can be printed online anytime using Click-N-Ship. All mailing products can be found at store.usps.com/store/home. To ensure timely delivery of holiday wishes by Dec. 25, the Postal Service recommends that cards and packages be sent to military APO/FPO/DPO addresses overseas no later than the mailing dates listed below. 1 PMEMS is available to selected military/diplomatic Post Offices. Check with your local Post Office to determine if this service is available to an APO/FPO/DPO address. 2 PAL is a service that provides air transportation for parcels on a space-available basis. PAL is available for Standard Post items not exceeding 30 pounds in weight or 60 inches in length and girth combined. The applicable PAL fee must be paid in addition to the regular surface price for each addressed piece sent by PAL service. 3 SAM parcels are paid at Standard Post prices with maximum weight and size limits of 15 pounds and 60 inches in length and girth combined. SAM parcels are first transported domestically by surface and then to overseas destinations by air on a space-available basis.